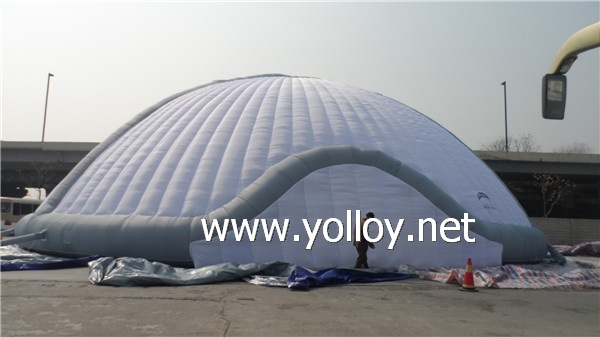 This inflatable dome tent is with size of 24m diameter. Thickness of wall is 1m.So the inside space is 22m diameter. If for restaurant,it can accept 37 tables and 370seats.If for conference，it can accept a 6x4m satge and 540 seats.If for concert,it can accept a 6x4m stage and 800 seats.Other capacity pls check the below pictures. Because the bottom need always contact with the ground ,so we used PVC tarpaulin(grey part) which mesh reinforced and both side PVC coated.It is very durable,wear resistant , flame retardant and easy to clean. If for big events, such as large evening party, dinner party or carnivals, it is really a good choice. Customized can be acceptable.If any special requirement，pls feel free to let me know.